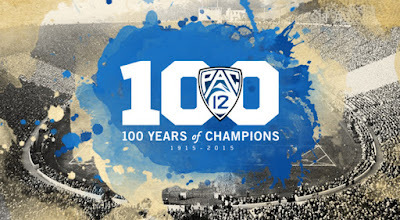 Ah, the 100th year of the Pac-12. Except it isn't. The Pacific Coast Conference, which formed in 1915, was dissolved in 1959 due to scandal (shockingly, athletes were paid) and reformed with fewer members under a completely different name. Oregon and Oregon State were charter members of the PCC but weren't allowed to join the Athletic Association of Western Universities until 1964, meaning the Ducks and Beavers were independents for five years- and played all their former rivals anyway. That deserves a separate post. We're here to capsule-preview Pac-12 football, so that's what's up. Are there any good storylines for this game? Look, the Wolverines won't make the Final Four, but they'll be out to prove something in Captain Harbaugh's first season. Michigan is the story coming into this game, but Utah will be the story coming out of it. They're better than you think. The Wildcats get no love. Only team to beat Oregon in the regular season? Got an at-large Big Six bowl bid? Returning plenty of guys and they're ranked lower than a Stanford team that disappointed everybody last year? I don't get it. These teams were terrible last year and the game they played was no different. I don't expect Colorado to be great before President Kanye takes office, if at all, but it would be nice if they showed signs of not being a doormat. Oregon State lost the best QB in conference history (Sean Mannion's record for passing yards might not last very long, but he has it) and the nicest head coach in college football (Mike Riley to Nebraska, and I'm not kidding). And even with that last year, they were terrible. New head coach Gary Andersen has already announced he's going with a two-quarterback platoon to start the year. This is not a good sign. I'm excited... to be hung in effigy in two cities! Just another small game on the schedule for the guy who made Boise State relevant nationally. 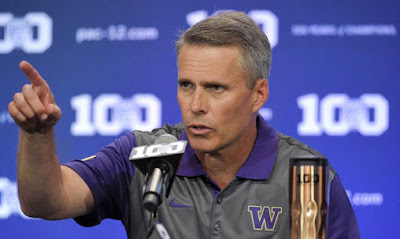 Chris Petersen was the man in Idaho, now he's trying to make the Dawgs do the same. He wishes he could go back in time and not schedule this game. I don't. Boise State might win this by 30. Nerd Bowl alert! I'm not buying Stanford until Kevin Hogan is gone, but there's no way they should lose to Northwestern. 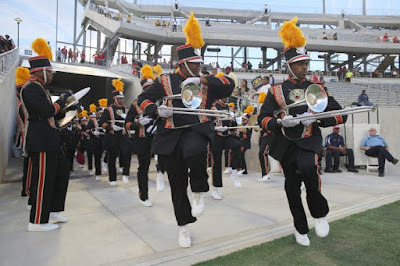 Also if you are excited to be indoors watching this game on Labor Day Weekend you better be a graduate of both schools. Any excuse is a good excuse to watch Mike Leach's quarterbacks throw for 500 yards. Unless there's a kickoff before noon against a questionable I-AA team on Labor Day Weekend. So maybe next week this Wazzu will be worth watching. The Bruins should have lost to Virgina last year and their QB situation is murky. They might be the worst 10-game winning team around. The first upset alert of the year. There are few better places to be than Strawberry Canyon on a September weekend. The Grambling band will perform at halftime, that's worth the price of admission alone. The Pac-12 marquee game of the weekend. The Aggies have the home crowd advantage but the Sun Devils are good. I see a close game and ASU doing something stupid to lose it at the end. For complete Oregon coverage throughout the year, visit AutzenZoo.com, of which I am a featured contributor (aka, I write stuff there too). The Trojans should be pretty good this season. But we won't learn anything about them this week. Eight wins by conference is very likely, ten would be great. Best chances to lose: Washington, Arizona State, UCLA, Stanford, Colorado, Wazzu (just because) and Oregon State. That's right, I don't think Utah will lose.